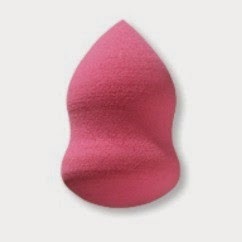 This week's review of the Beauty Blender Sponge Dupe from lecosmetique.com is is brought to you by Guest Reviewer Courtney of San Francisco, who shares my interest in meticulously researching obscure beauty items. Concerns: wrinkles, dark circles and bags under eyes, uneven skin tone, scars, aging. Allow me to start this review by discussing what is a Beauty Blender Sponge. It is a pink makeup sponge that is shaped like an egg and priced at $20. You can find it easily online at Sephora.com here. This sponge has created a huge buzz for it's ability to apply liquid or cream foundations seamlessly on the face, creating a flawless and airbrushed finish. It sounds fantastic but $20 per sponge is pretty steep for those on a budget or who just want to try it out to see if they like it. Thankfully, you can find several duplicate copycat sponges on places like Amazon or Ebay. The problem is how to choose the right duplicate or "dupe." When my friend Cat first suggested I look into a beauty blender dupe, I was skeptical. For over 20 years that I've been wearing makeup, I have been applying liquid foundations with my fingers. I now use BB cream instead of foundation most of the time, but I still apply with my fingers and buff in with a brush. Past experience with those flat wedge shaped sponges in the past always proved to be a waste of time for me because I didn't like how so much product soaked into the sponge and felt just using my fingers was much easier and more efficient. However, when I spent some time online researching the beauty blender and how to use it, I was intrigued. What makes the beauty blender sponge different from makeup sponges in the past is it's shape and the fact that you must dampen it. The egg shape allows you to use it's rounded bottom to bounce against the face, applying your foundation or BB cream in a way that does not create lines. The damp sponge allows the sponge to expand and become very soft while also preventing the sponge from soaking large amounts of your product. I knew two things, I wanted to try this new way of using a sponge and I did not want to spend $20 to do it. Therefore, I spent several hours scouring the web for beauty blender dupe reviews. I finally found several good reviews for the Blending Sponge at lecosmetique.com. I read online that compared to other dupes, including the well-known Sonja Kashiuk one found at Target stores, this sponge from Le Cosmetique has a texture closer to the real Beauty Blender by being very soft and not overly dense after being moistened. Not only that, these sponges are only $5.95 each and the Sonja Kashiuk ones are at least $10 at Target. I purchased two of these sponges, one in pink and one in black. The other colors available are red, purple, and yellow. The first time I used it, I ran it under the bathroom tap in warm water. It did not expand much at first which was disappointing. What I learned is that you MUST let it soak thoroughly, squeeze the water out, and then repeat soaking and squeezing several times to enable the sponge to get thoroughly drenched inside. You know that the sponge has been soaked and squeezed enough when you can visually tell that it's grown about 3 times it's size and has become very soft and squishy. Then, after squeezing the last bit out and taking care not to nick the sponge with my fingernails while doing so, I then squeeze it inside a soft towel just to get rid of the last of the excess water. I've tested the sponge with MAC Studio Fix liquid foundation, Missha M Perfect Cover BB Cream, and Fairydrops Candy Bar BB Cream. I have found success in varying degrees with all three. - MAC foundation: I found that it gave me a much lighter and more natural finish and it does indeed blend seamlessly. Although i had always been happy using my fingers to apply foundation, I found that using the sponge and bouncing it against my skin did it much more evenly and there were absolutely no streaks. I will always use the sponge with this from now on. - Missha M Perfect BB Cream: A very creamy and thickly textured BB cream, I found that the sponge worked wonders spreading this evenly over my face without it caking. I also found that the damp sponge helped thin out the BB cream a bit to make it easier to apply. When I used to apply this BB cream with my fingers, I do believe I was putting on too much and it was causing me to break out. The sponge allows me to apply it thinly but still evenly and with good coverage. Because of the success of the sponge, I will most likely repurchase this BB cream since the only thing I didn't like about it was it's thick texture. - Fairydrops BB Cream: This is the thinnest of all 3 products that I tested with the sponge. It is my favorite BB Cream and is very easy to apply with fingers and sponge alike. Although I do prefer to use the sponge now, applying with my fingers had the same visual result. After using the sponge, I clean it by wetting my hands and placing a bit of antibacterial soap in one palm and then gently rubbing the sponge against my palm to cover it in soap. I then run it under the warm water from the tap and squeeze it often to work the soap in and out of the sponge. Inevitably, there will be stains from any foundation or BB cream so it's a waste of time to try to scrub it out. Instead, you are more likely to damage your delicate sponge. It is quite easy to nick it with your fingers if you aren't very gentle with it. It's better to just live with the stains. Afterward, I simply store it in the bathroom on a clean shelf after I've washed it, squeezed it with a towel to get rid of all excess water, and let it air dry. Bottom line, I think this sponge is a fantastic deal. It has completely converted me as a fan and I will never use MAC foundation or thicker BB creams without having this sponge on hand. The price is a fantastic deal if you compare it to the original Beauty Blender. I've used my sponge at least a dozen times and other than a light stain from my makeup, it is still in perfect condition. Le Cosmetique used to have have free shipping anywhere in the continental US but now they only offer it with a $50 or more purchase. I suspect this may be because their sponges are quickly gaining reputation as being an amazing deal and they have an uptick in orders the past year or so. They've also raised the price of this sponge at least twice in the last year. Therefore, I advise anyone who is interested in giving it a try to do so soon and consider getting two or three at a time or buy in bulk to share with a friend. *Note from Cat: I can confirm that Courtney purchased this item with her own money and that all opinions she has stated are unbiased and based off of her personal experience. Here's hoping she shares more of them with us! I use a beauty blender dupe myself, but I will say that it sounds like this sponge is softer and less dense than the ones I have, so I will definitely try it out myself now that Courtney has given it the green light. Leave a comment below if you have any questions, or if you have a Beauty Blender and/or dupe and want to share your own experiences with them! I got one of these from Santa. What I love about it (along with great application) is that application is 'Lightening Fast'. An essential item for those who use foundation. Thanks for the love :) and thanks for the tip! I will definitely check out my local TJ Maxx and scout out any blender sponges they may have stashed away. Wonderful review! A note to the eco-conscious; the Sonia Kashuk blending sponges are recyclable and biodegradable, and the Lecosmetique ones don't seem to be.